Do you want straighter teeth? They can help improve your smile, the alignment of your bite, and your confidence. But traditional braces with wires and brackets can take years of treatment to achieve the final results and are bulky and more challenging to care for. 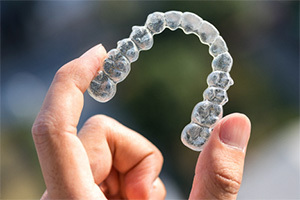 Well, you have another option available, one that’s proven to work faster—Invisalign. At Lakeside Daytona Dentist, we are proud to offer this advanced, effective method of straightening your teeth. After you and one of our talented dentists have determined that Invisalign is the right solution for you, we take impressions of your teeth, which are used to create your personalized treatment plan and the clear alignment trays. These clear alignment trays gently apply pressure to your teeth, guiding them into position. Every day, you wear them for 20 to 22 hours, taking them out only for eating and cleaning. As a result, your teeth shift slightly over the course of a couple weeks. Then you switch to the next set of trays, bringing you one step closer to straight teeth. Fast results. Traditional braces can take between 24 and 36 months to complete treatment, but with Invisalign, you need 12 to 18 months to reach the final results. Easy maintenance. The clear alignment trays are easy to keep clean. Simply use your toothbrush and toothpaste on them every night before you go to bed. No food limitations. Because the trays are removeable, you don’t have to restrict what food you eat. Easy oral hygiene. The brackets and wires of metal braces make it more difficult to brush and floss your teeth, but Invisalign allows you to easily maintain your healthy oral habits. More advanced alignment issues. If your teeth are severely misaligned, traditional braces may be your best option. Forgetfulness. 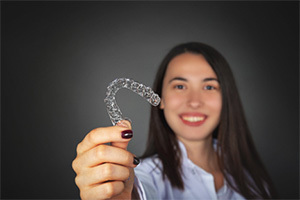 Everyone forgets things sometimes, but if you or your teen tends to misplace things or forget often, treatment with Invisalign can be more difficult. Following instructions. It’s crucial to follow the instructions we give you for treatment and care of your alignment trays. Not doing so can result in delays in your treatment and more expense. 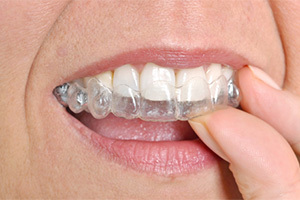 The best way to know if you are a good candidate for Invisalign is to make an appointment with us. We can discuss your specific situation and determine the best course of action to get you the straight smile you want. Our team at Lakeside Daytona Dentist uses the best technology and treatment to bring you options that are proven to work. We look forward to helping you achieve your smile goals with this advanced straightening treatment. Schedule a consultation with us today to get started!